Yo kitties and music fans! 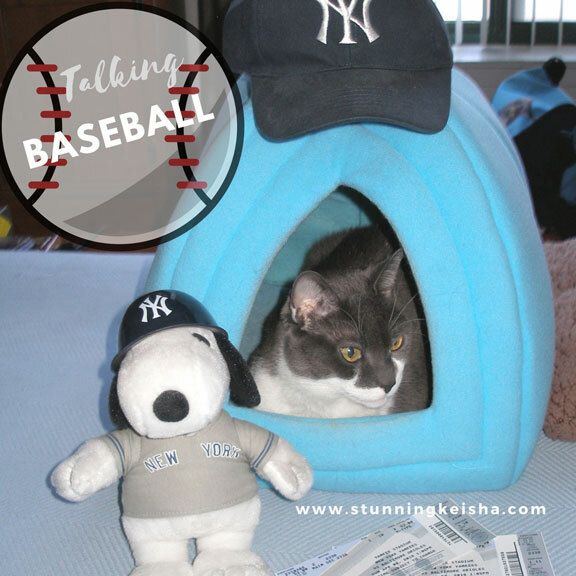 We're talking cats and baseball! What a pawsome combination. In the Spring a cat's fancy turns to baseball. It's hard for TW to take a photo of me NOT in the igloo. I refuse to pose anywhere else. MOL! Our Easter was uneventful except when TW stepped in my gut rot. She didn't think it was funny. As you can see from the tix in the photo shoot, they're gonna be leaving me alone soon to go to a game. I'll be announcing a pawty in the condo on my FB page with nip, vine, noms and treats. I was plied with many treats to get me out of the igloo for some pics. I have a couple of new kinds of food I've been eating that I'll share during the pawty. Those Nutrish Purrfect Entrees are to die for except I have no plans of dying. TW bought them in the supermarket. Let's get to the music. This week we got to choose any theme we wanted for Music Monday. Last Thursday was the start of the baseball season so we thought that would make a great theme. There have been a lot of great baseball songs. Likewise, they play lots of music during a game. Each player picks a song or songs they want played when they come to bat and pitchers have theme songs they enter to. Oops, the players are taking the field! Play ball! Back when WNEW-fm was free-form, dj and Red Sox' fan Jonathan Schwartz used to play this song every Spring. The past few years TW has tried to find it on YouTube and finally succeeded. Claire Hamill has the "Baseball Blues." So does TW as the season hasn't started as she thought. She always expects the Yankees to go undefeated. Next up is the Boss and his song "Glory Days." TW and Pop saw him at games a few times. The video for this song was recorded at TW's old stomping grounds—Maxwell's in Hoboken. The waitress in the video is Martha who was a real waitress and bartender at the club. Jonathan Demme shot a couple of videos at Maxwells and TW actually got to be in the filming of one of them. Let's talk Yankee baseball. This is our heart team who everyone has high hopes for this season even though they haven't gotten off to a very good start. Terry Cashman first recorded "Talking Baseball" in 1981 and then recorded a version for each major league club. The Yankees have had their share of great centerfielders—DiMaggio, Mantle, Williams, Mickey Rivers although due to injury, they're currently without one. John Fogarty has written some of our fave songs both for CCR and his solo career. Here's a song about the Yankee dynstasty from the late 1990s. How we loved those teams! At least the peeps did. I wasn't born yet. The peeps were always ready to do the "Yankee Mambo." As unlikely as it seems to hear a Ramones' song at a ballgame, PA announcers use this one to rev up the crowd. TW always laughs when she hears it while she's shouting out the lyrics and dancing. Johnny Ramone is a huge baseball fan. And now the closer—yes, I'm talking 'bout the greatest closer ever. The peeps totally miss hearing "Enter Sandman" every game when the Yankees had the lead. It was Mariano time and this was the song that played when he came out of the bullpen. When the team honored Mariano, Metallica were there to play the song live. Even Pop became a head banger when he hears the first bars of this song. "Exit light / enter night / take my hand / we're off to never-never land" I'm sure it gave nightmares to opposing teams. In the NY area, this song will forever be linked to Mr. Rivera, the greatest. Thanks to Curious as a Cathy and XMas Dolly for hosting Monday's Music Moves Me blog hop. I'll be back with some decorating tips on Wednesday. 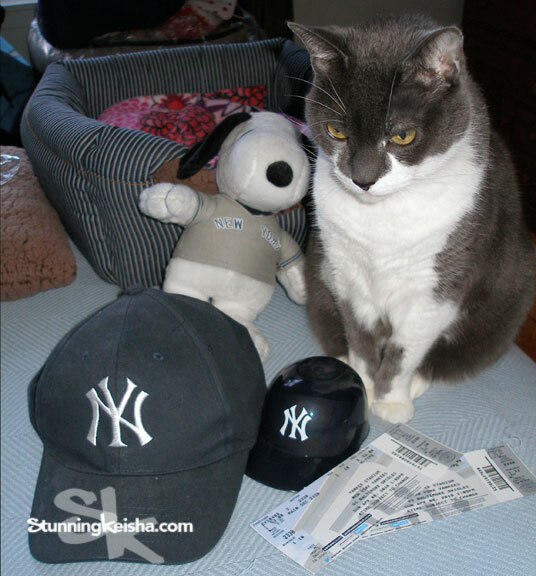 Do your humans root for a favorite baseball team or do you have a favorite baseball song? We are not big baseball fans here, mainly because we are close enough to Dodger Stadium to have to deal with traffic during home shows. My human is always checking their schedule for workarounds. BTW, that Metallica song is one of my human's favorites, even though Master of Puppets is her fave album. Those are cool ball tunes CK, we always did like Centerfield! I hope your peeps have fun at the game and hope Yankees will win! I'm not a baseball fan but I loved playing when I was kid and even enjoyed going to the games while on summer break. You're the second person to come up with this theme which is an interesting surprise. However, you added a few more tunes to my baseball song education. Thanks for hitting the dance floor with me and have a great! Those were some really good songs. Not a big fan of watching baseball, but I like playing it. I had no idea baseball player choose the music that they want played when they're up to bat. Loved all the selections! My sons used to play baseball and this time of year was always filled with activity and FUN! I miss it. Loved the photos, too! Keisha is so photogenic! I lived near Sox Park when I was little & in fact my dad taught me how to drive in the parking lot there on the days it was closed. Wow Great memories you stirred for me. Thanks much & the tunes wow I haven't heard them in years! Great job getting them all together! THANKS MUCH for sharing. Those songs are purrrfect, CK! Though we heard TW and Pops didn’t get to see the game today after all. What’s with Mother Nature and the snow?????? I hope the weather improves! Our 11 year old nephew was dressed in his Yankee jersey, socks and sneakers (don't worry, he had pants on too) ready to go to the opener - but Mother Nature had other plans. I used to be a huge Mariners fan (grew up in Washington). Now I'm a few miles away from Angels stadium. We usually go once a year, but definitely wouldn't all myself a baseball fan. But going to the park is always a fun experience! We don't watch Baseball, but it was Mom's Grandfather's favorite! (He was a Bronx Fan). We LOVE all your choices for Music Monday!